Nestle world No-1 food manufacturing conglomerate has launched an innovative product named Aero in UK and Ireland . It contains chocolate with round biscuit thus giving consumers a unique taste of both . Its quite different from popular chocolate enrobed wafer biscuits One of the world popular Nestle chocolate wafer biscuits brand is KIT KAT . Nestlé’s Aero chocolate bar brand has launched its first ever biscuit in the United Kingdom and Ireland. 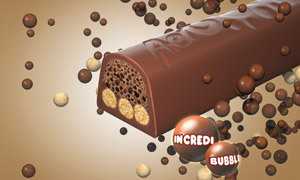 Aero Biscuit, which combines the iconic brand’s air-bubble filled chocolate with round pieces of biscuit, is aimed particularly at women aged from 25 to 44. Graham Walker, Trade Communications Manager for Nestlé UK, explained the significance of the new Aero addition. He said: “Aero Biscuit will bring consumers who currently buy chocolate confectionery into the biscuit category.